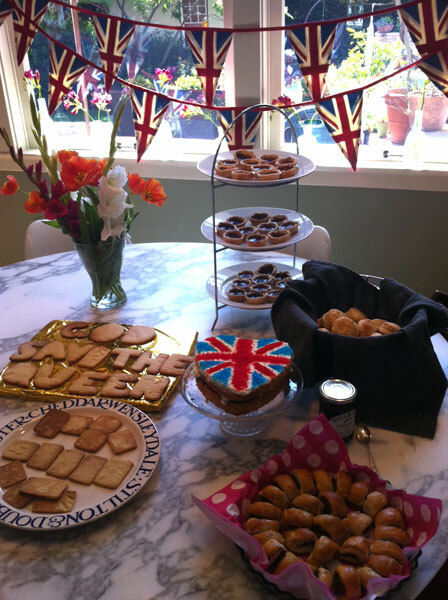 It has been a busy weekend celebrating the Queen’s Diamond Jubilee with lots and lots of bunting, cool cucumber sandwiches, God Save the Queen biscuits, towers of jam tarts, Victoria Sandwich Union Jack cakes, sausage rolls, Jammie Dodgers, the Battenberg cake that didn’t happen, batches of scones and cups and cups of tea. I feel like I ate my way through Nigel Slater’s Eating for England . 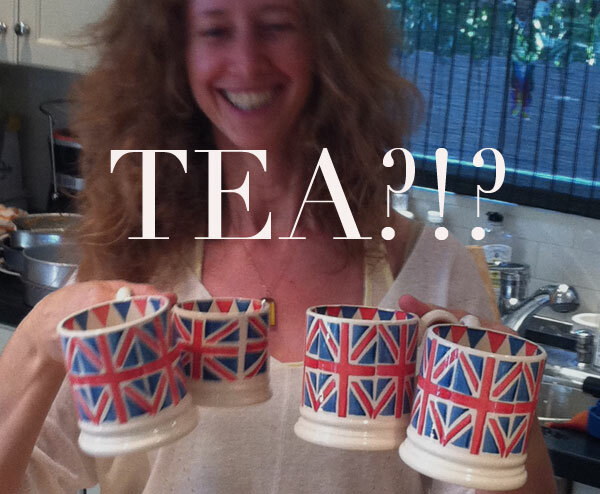 On Saturday my friend Charlotte hosted a tea for four Brits here in LA – whilst we sat inside sipping our tea out of Emma Bridgewater Union Jack mugs and nibbling on cucumber sandwiches the children all swam in the pool under the keen eye of a lifeguard. Totally civilized and so good for the soul. I made a batch of scones (recipe below) and brought along a jar of English Tiptree Strawberry Jam and a pot of excellent Clotted Cream. And the all important PG Tips tea bags! 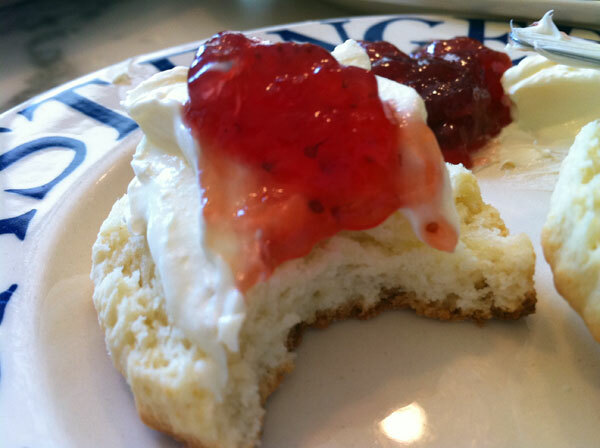 Are you a jam first or a cream first on the scone ? I believe I go for the cream first as a true Devon lass should – although with all my ancestors from Cornwall I could also go jam first – although it doesn’t feel quite right somehow. Either way they were delicious. There’s something about the soft cake-like scone piled high with rich, thick, silky cream and a dollop of sweet jam that is irresistible. Abby ate 5 and claimed they were the best she’d ever eaten! Now that’s praise for you coming from another Devon native (who also went cream first, obviously). When the children had finished swimming they all sat down outside in the shade of a large tree and ate sausages, mash, peas and corn on the cob. This was followed by individual jellies, a teddy bear jelly, Victoria Sandwich cake decorated with a Union Jack and Charlotte’s mini chocolate eclairs that disappeared as fast as we kept replenishing the platter! Sunday morning the jubilee celebrations continued bright and early. Thankfully BBC America showed the entire Thames Jubilee Pageant in great detail so that we could at least soak up a little of the atmosphere. 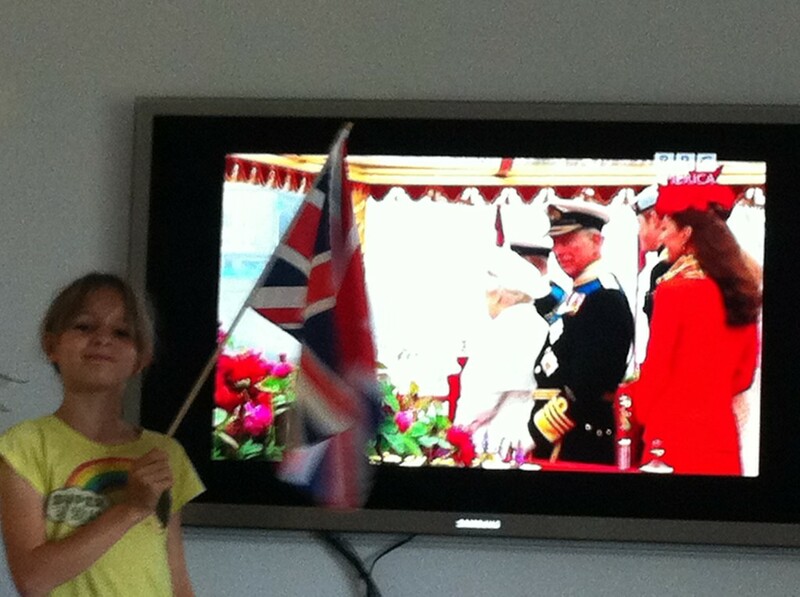 Here’s Minty waving a flag next to her majesty the Queen, Prince Charles, Prince Harry and the Duchess of Cambridge. My English family were all gathered in my sister’s office at Billingsgate on the banks of the Thames near Tower bridge – the HQ of the BBC broadcast happened to be downstairs. Oh how I wish I could have been there with them – waving a flag and sheltering from the miserable weather. In case you missed it here’s a pretty cool 3 minute version of the event that shows all 1000 plus vessels, including the Royal Barge, racing along under Westminster Bridge. Another batch of scones baked and still warm from the oven, more jam, more cream, some Royal souvenirs and we were off to Caroline and Trevor’s Diamond Jubilee Tea Party. 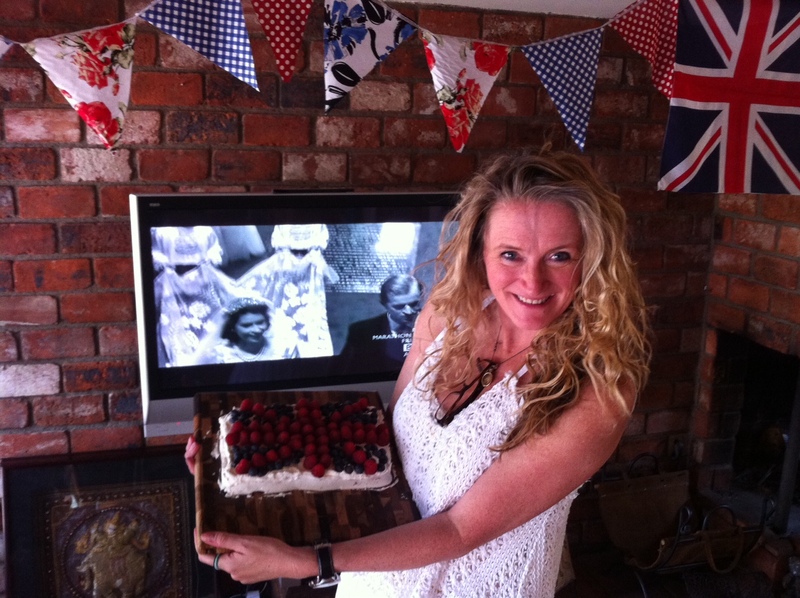 The Hostess with the most-ess – with lots of bunting and images of the Queen on her wedding day playing on the TV behind. 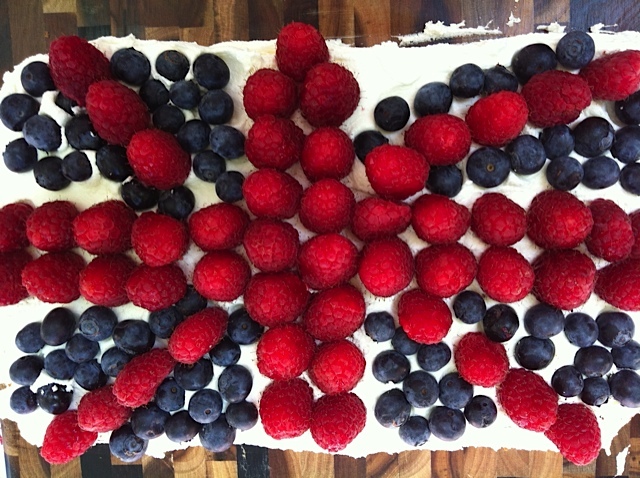 Union Jack cake anyone? This one was a tad simpler using berries rather than the sugar crystals and having to cut up paper for templates from the previous day. I have very strong memories of the Queen’s Silver Jubilee in 1977 – in particular a 3-legged race I took part in with Sarah Winlaw which was filmed by her father – I must track down a copy. I believe Minty and Rémy will remember the Diamond Jubilee as the weekend Mummy cried her way through a very grey looking show with lots of boats going up the Thames, perhaps the Queen or the Duchess of Cambridge (Minty liked her red outfit) and the hotel we stayed in last summer next to the London Eye. 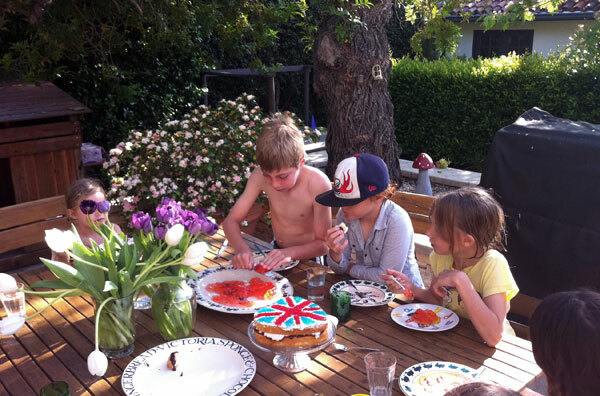 They may also remember my obsession with Union Jacks and the endless baking of scones – neither child is that keen and would take a Jammie Dodger or better yet an eclair over a scone any day, Jubilee or not. When I tell you this recipe is simple and quick I really mean it – a few pantry ingredients that make up the perfect tea-time vehicle for a good amount of clotted cream and some sweet strawberry jam! 1. 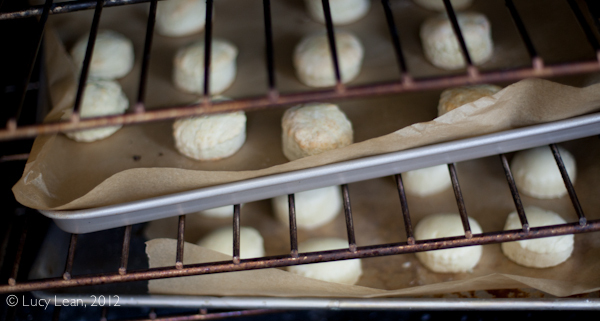 Pre-heat the oven to 425 F. Line two baking sheets with sheets of parchment paper. 2. Put the flour, baking powder and salt in the bowl of a food processor and mix on high for about 10 seconds. 3. Add the butter and process until mix resembles breadcrumbs, about 45 seconds. 4. Add the sugar and mix in for 10 seconds. 5. Slowly pour in the milk through the top as the processor is on high to form a soft dough. As soon as the dough comes together stop pouring in the milk. 6. 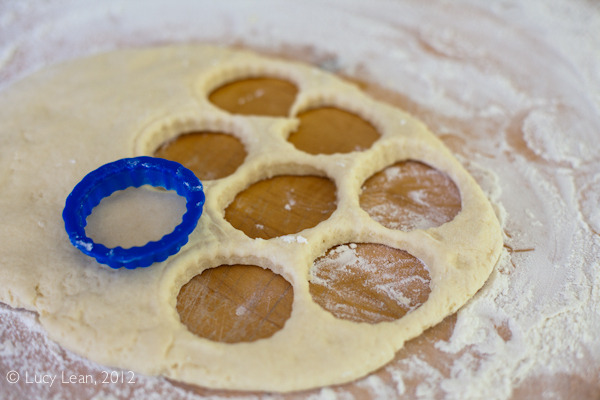 Turn dough out onto a floured work surface and gentle pat into a round about 3/4 inch thick. Use a small round cutter to cut out scones and transfer to parchment paper lined baking sheet. When all the rounds are cut knead the dough together very gentle to cut out more scones, continue until all the dough is used up. 7. Bake for 12 – 15 minutes until the scones have risen up and the tops are just turning golden brown. 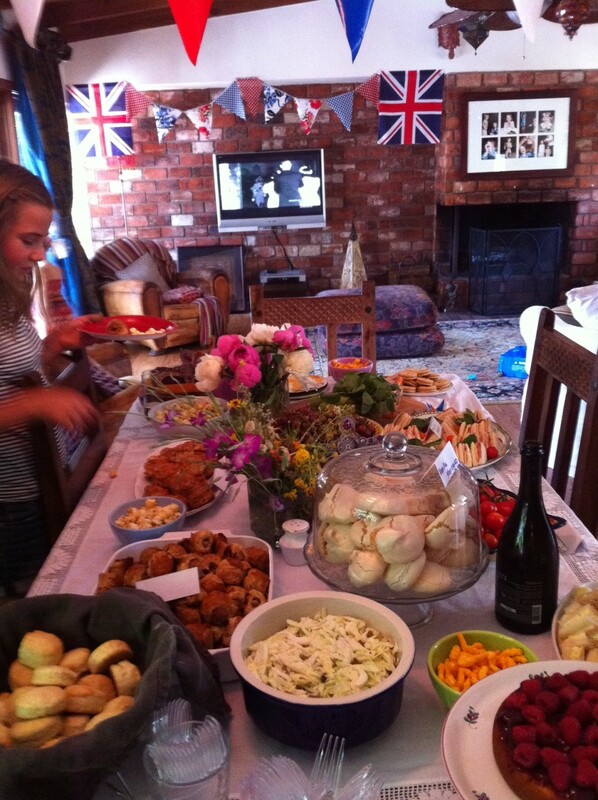 Serve with clotted cream and strawberry jam – debate until eternity which should go on the scone first – in between a discussion about how well the British do pomp and ceremony despite the torrential rain and how we all love her majesty the Queen. How fun! 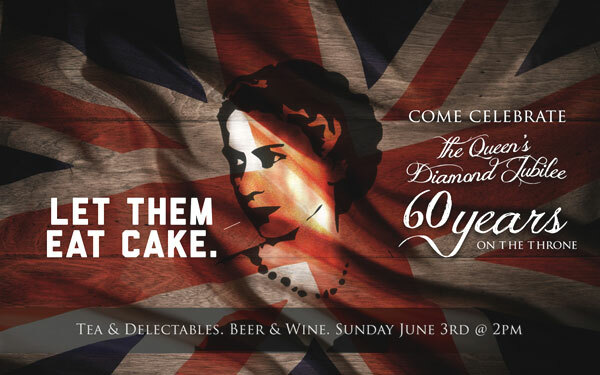 This looks like a great Jubilee! Can’t wait to try this recipe! I’ve only recently discovered the joys of clotted cream (shameful, I know), but I am definitely a cream first girl.